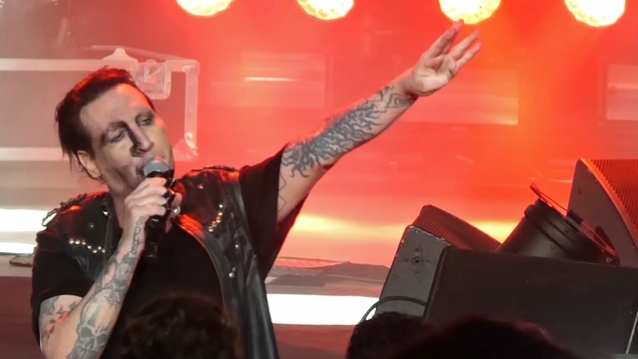 Marilyn Manson cut short his performance Saturday night (August 18) at Cynthia Woods Mitchell Pavilion in The Woodlands, Texas due to a reported case of "food poisoning." According to HoustonPress, Manson's tour manager escorted photographers from the pit prior to the start of the shock rocker's concert, explaining that the singer was feeling very ill and did not want his picture taken. Manson "gave it his all" during the four-song set even though he was "mostly stationary and visibly shaking at times." Upon finishing "Sweet Dreams", Manson "collapsed on top of one of the monitors," the site reported. "Roadies could be seen on the side of the stage worriedly contemplating on whether or not to assist him." Marilyn's tourmate Rob Zombie played his usual set, although the planned duet with Manson didn't materialize. "My dear friend Mr. Manson is feeling under the weather," Rob told the crowd, according to HoustonPress. "He's probably on the bus feeling like crap. I need a partner for the next song so let's sing it really loud and make him feel better. This is 'Helter Skelter'." Late last month, Manson canceled a show in Toronto, Ontario, Canada minutes before showtime because he was suffering from "the flu." Both concerts were part of the Manson's "Twins Of Evil: The Second Coming" tour with Zombie, which kicked off in July. Marilyn is on the road supporting his latest album, "Heaven Upside Down", which was released last October. The singer injured his lower leg in a freak accident on stage during a concert last fall in New York City, resulting in the postponement of nine tour dates. A short time later, longtime Manson bassist Twiggy Ramirez (real name Jeordie White) was fired from the group following allegations of sexual assault. Manson returned to touring last November.